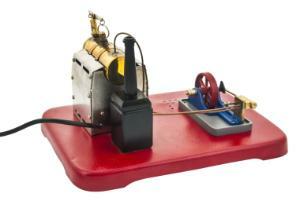 Operation of a commercial steam engine is well illustrated with this working model. The extra large size unit is provided with a horizontal boiler and whistle, safety valve, and steam gauge on metal base. Important Note: Operates on 220V AC. 50 Hz.